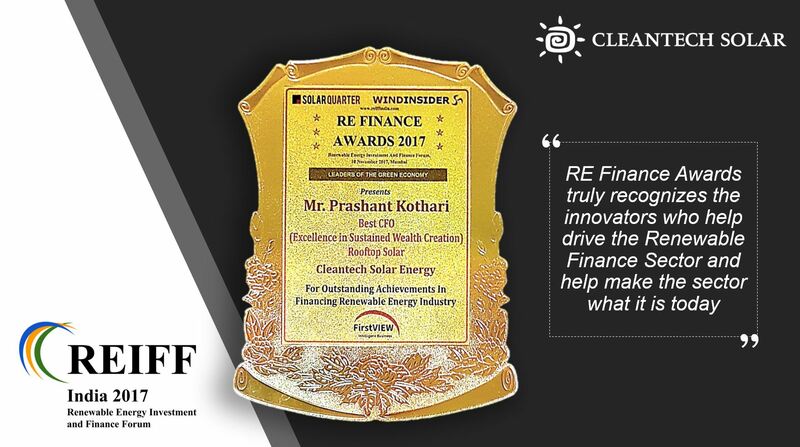 10 November 2017 – Mr. Prashant Kothari of Cleantech Solar, was named “Best CFO (Excellence in Sustained Wealth Creation)” of the year at the Renewable Energy Investment and Finance Forum, REIFF India 2017, an annual event hosted with an objective to promote the dialogue between economists, policy makers, industry representatives and banking experts on numerous topics in the field of clean energy. RE Finance Awards 2017 aims to recognize critical achievements and developments in the financing of clean energy sector, and rewarding those committed to the growth of the green economy. And Cleantech Solar is honoured to be recognized along with Mr. Prashant Kothari by REIFF Awards as one of the innovators who help drive the Renewable Finance Sector and help make the sector what it is today. Together with the strong leadership team, Cleantech Solar will continue to strive towards a low carbon and sustainable economy through long term solar partnership with corporations, and at the same time delivering healthy financial returns for our investors.